They were used in America for farm work in the early 1900’s. One of the most well-known Mammouth Jacks in the 20th century was Jen-Jack a gray Mammoth of Dodge City, Kansas who sired some of the most famous Mammoth Jacks - among them Bully Boy, Finally Friday, Too Tall Jones, Brarnoth Ebony, and Amarilio Slim to name a few. In America when tractors and modern machinery were introduced in the 1940’s and 50’s, the Mammoth Jack suffered the same fate as many working horse breeds, they were no longer a necessity for farm work and the breed nearly died out. 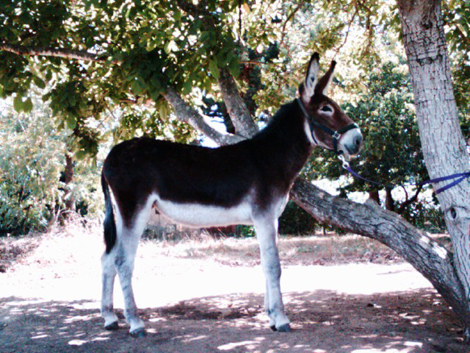 Today, three are fewer than 1,000 Mammoth donkeys registered in the United States each year. The largest living mammoth donkey on record today however, stands at 17 hands and resides in Waxahachie, Texas. The North American Saddle Mule Association and the American Mammoth Jackstock Registry have worked to keep the Mammoth Jack from becoming extinct.